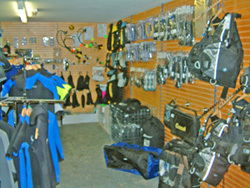 The National Diving & Activity Centre Shop has a vast selection and a wide range of fully stocked diving equipment. Our suppliers are some of the best manufacturers of diving equipment, not only from the UK, but also from leading European retailers. For a full list of suppliers please pop into the shop to see for yourselves what we stock. If you are thinking of treating yourself or a loved one to some new scuba diving equipment then the NDAC is the place to satisfy all your diving needs, we even (on selected items of equipment) let you try before you buy, which will beat any high street outlet - How many other dive shops have their own inland dive site! All in all, we offer you the customer a fantastic opportunity to purchase some of the UK’s finest diving equipment at unbeatable offers with the opportunity to try it out in our quarry. We understand that we may not always be the cheapest, but we will offer a complete service from start to finish. When you buy from us, you are not just buying a product at a great price, but a piece of diving equipment that you need to be 100% happy with because your your life may depend on it. If you are after any specific type of equipment that we do not have in stock don’t worry we are usually able to ring through an order for you and have it on site within a few days. Our staff in the shop are always willing to help you with any questions or queries you may have. So when you are next down for a dive please pop into the shop for a look round you will be surprised just how many different products we stock. We value your custom and if you have any comments on what you think we should stock then please contact us and we will see what we can do.